Ideal for anything from 10m airgun to 50m Free Pistol or small bore rifle under even in low light. Scope alone weighs 260gr, that 9 oz and its only 7 1/2" long. Really! Picture to prove! Scope packed in cordura case 11" x 6" x 4". Impossible to damage, unless desperate measure is taking! Will focus from 7' to infinity. Field of view 68" @ 50m. 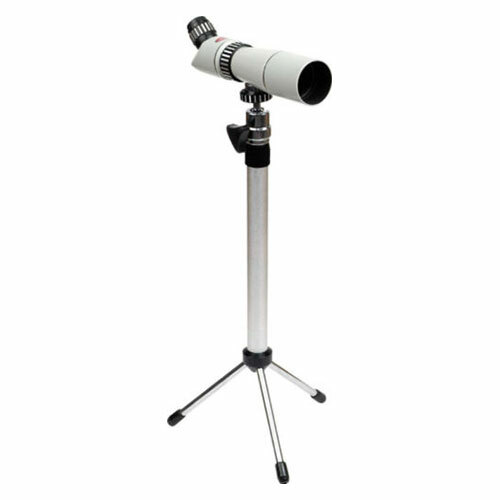 Tripod telescopes from 15" to 22" (bench to centerline of sight). Camera adaptor included, this will allow you to use most of the camera tripod on the market.